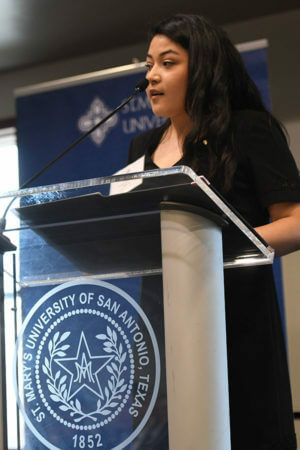 Jocelyn Alvarez Bibian, junior Marketing major, delivers a speech at the annual scholarship luncheon at St. Mary’s University on Feb. 13, 2019. Donors and scholarship recipients gathered on Tuesday, Feb. 13, at an annual luncheon to celebrate the awarding of nearly $5 million in endowed scholarships at St. Mary’s University. The benefactors in attendance support students in the arts, humanities, sciences and technology, business and athletics. Of about 150 endowed scholarship recipients studying at St. Mary’s, 35 attended the luncheon. One recipient at the luncheon was Jocelyn Alvarez Bibian, a junior Marketing major. Bibian came to the United States about five years ago, and after graduating high school, she arrived at St. Mary’s as her first-choice school. Bibian said she is thankful for the help she received to achieve her dream of graduating from St. Mary’s with a business degree and to become a professional who helps ensure diverse consumers are represented in the beauty industry. “Thanks to the donors, I will be able to leave with a college degree, four years of amazing memories, an education grounded on my faith, long-lasting relationships with friends, mentors, professors and staff, and a new place to call home,” she said.